In the centre of Bungay in Suffolk stands the Buttercross, a large vaulted and domed monument, beneath the shade of which the dairy farmers of Bungay once gathered to sell their prized butter. During those heady, buttery days, Suffolk was regarded as the “butter capital” of England. East Anglian butter was sought after by every foodie worth their weight in grouse and was exported as far as the West Indies (Defoe 1724). 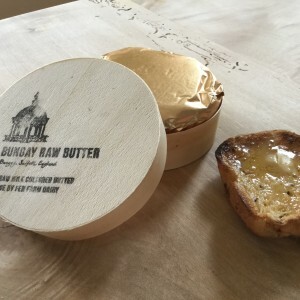 Our Bungay Raw Butter is the UK’s only raw farmhouse butter produced by using a lactic culture. 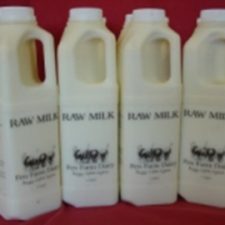 It is made by hand on the farm in the traditional way, by souring the cream using a cocktail of lactic bacteria, before churning and hand-paddling with traditional scotch ‘butter hands’ made from wood. 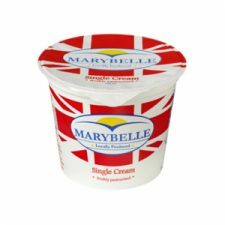 It is the closest thing to the original Suffolk butter. 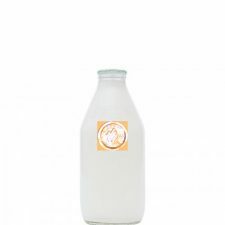 We use the milk warm from milking and our grass-fed cows are an ancient breed, Montbeliarde, hand- picked by Jonny from small farms in the Jura region of France. 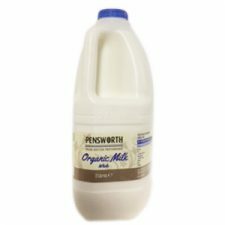 They only give a small amount of milk but it is rich and high in protein, producing beautifully creamy and complex flavours. A true farmhouse butter.